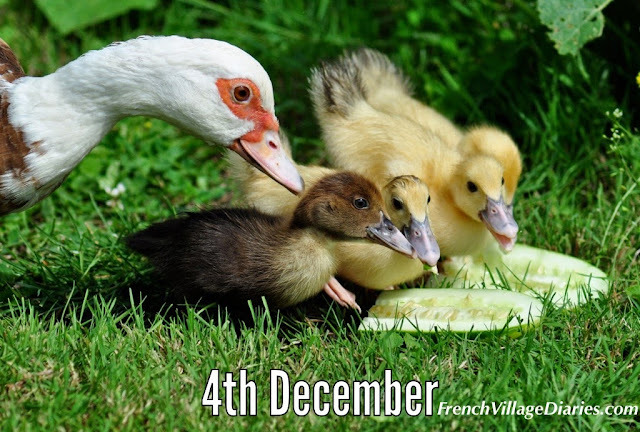 It’s the 4th December and D is for Duck. We have had our own ducks wandering and foraging on our land since 2005 when a lone male Muscovy duck arrived in our orchard. After a few days it looked like he was happy to hang around so we named him Yum Yum and bought him a little gaggle of females for company. If I am not quick enough to collect their eggs, or if one of the females outsmarts me with her hiding places, we have ended up with ducklings. There is nothing quite as cute as a fluffy yellow duckling, but trust me, they are hard work. Keeping free-range birds safe from predators is tricky at the best of times and especially as ducklings will wander everywhere, including through the tiny holes in the fence between our neighbours and us. We've kept the females for their eggs, but as there are only so many males you can keep together, over the years we have enjoyed some tasty home raised duck too. Here is one of my favourite duck recipes, taken from Raymond Blanc’s Foolproof French Cookery a book that was a present from friends when we moved to France and has been well used over the last ten years. Score the skin of each duck breast about six times, being careful not to cut the flesh and then season with the salt and pepper. In an ovenproof frying pan on a medium-low heat, cook the duck skin-side down for 10 minutes to melt the fat and crisp the skin. Spoon out the fat a few times (and keep for roasting potatoes). Turn the duck and sear the flesh for a minute. Turn back to skin-side down and place in a hot oven for about four minutes, then allow to rest for another four minutes before serving. I think roasted vegetables like beetroots, courgettes (zucchini), squash and potatoes go very well with this dish. If you have missed my previous advent posts you can catch up by clicking on the letters A, B and C. Don’t forget to pop back tomorrow for the letter E, a rustic French countryside delicacy.